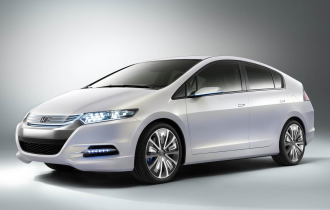 Honda today released a single image of the production version of the upcoming Insight hybrid. The version pictured is the US variant, so UK cars may look a little different around the headlamps. The overall shape and indeed the body panel pressings appear identical to the Insight Concept unveiled in September. The changes are typical concept-to-production alterations and include bulkier door-handles, larger door mirrors, smaller wheels and taller tyres. The LED headlamps and foglamps are also replaced with conventional units, and the grille back-lighting has probably also been deleted. The new image doesn't give much away about the rear, although what we can see of the rear lamp cluster is again less striking than the concept's bold red triangles. All in all, though, it's still an attractive beastie, we reckon. It will certainly give the upcoming new Prius a run for its money. Leaked images of the third-generation Toyota hybrid look fussy and over-designed next to the clean-lined Honda.